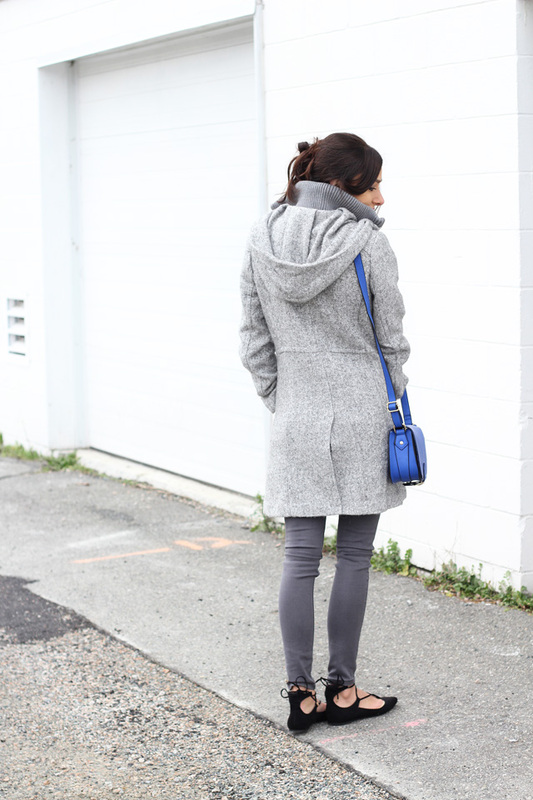 For me cobalt blue has always been such a fun colour to wear, especially in the winter time when I want to brighten up my neutrals. 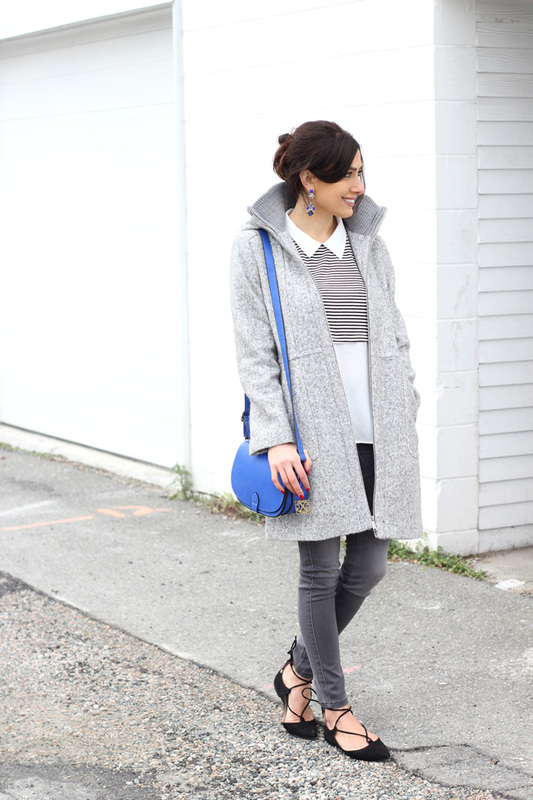 Today I'm pairing my neutral outfit with a cobalt blue satchel and a pair of blue drop earrings. To finish off the look I added a pair of black lace up flats, dark grey jeans, a grey knit coat, and a striped black and white collar blouse. Today has been such a hectic day and I'm about ready to pass out!!..:-). Hope everyone has a great night! And thanks so much for stopping by! Great look!! Love your earrings. Love this look! I'm especially obsessed with those beaitiful shoes! What a pretty look! I love your satchel - the color is fantastic! And your hair is super cute. Love it! You look great. Love the coat and the bag! Loving the soft colors! This look makes me smile! I love how cozy and classy this outfit is. The bag and earrings really pop, which is awesome! 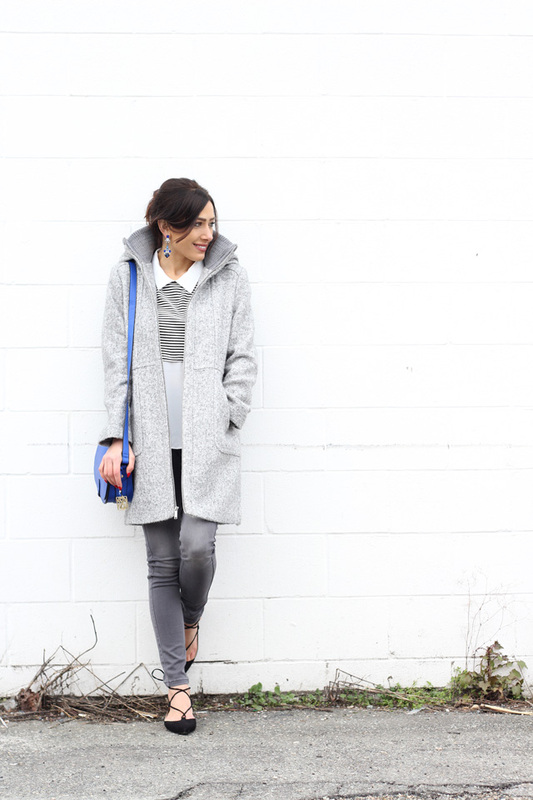 I really love the grey tones in your outfit! The pops of blues are stunning as well! Love the layered look of this top, and the entire outfit in general! You look adorable! I love this outfit! I love the pop of blue here! Cobalt blue has always been one of my favorite colors. I even had my brides maids dresses in that color. Love the gray coat too. You look street style chic Ella! You look GORGEOUS! 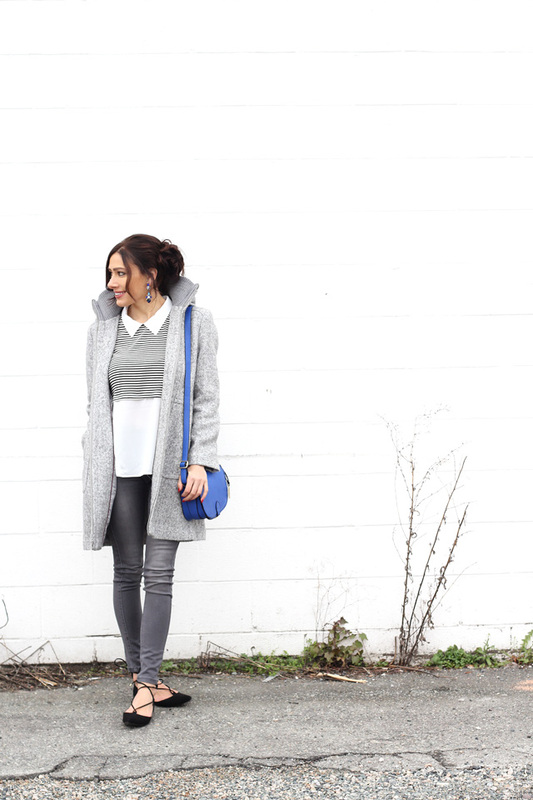 I love the grey on grey and the pop of cobalt! Great outfit! Im checking out this brand. 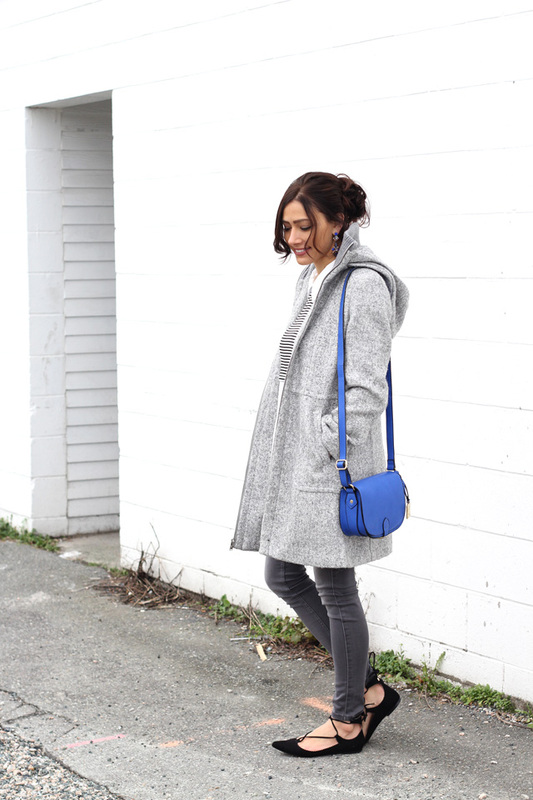 You have the CUTEST coats from them! Grey and blue are my absolute fav combination! And cobalt is one of my most loved shades! This outfit is perfection and u look lovely! Gorgeous outfit!!! 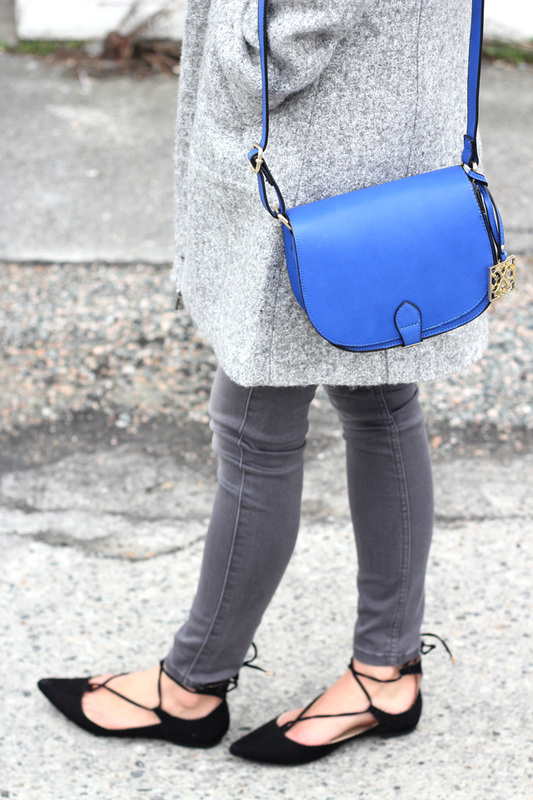 I love the blue bag, it adds such a beautiful pop of color to the outfit!! You look stunning!! Thank you Esther:-). Cobalt blue is such a fun colour to work with! 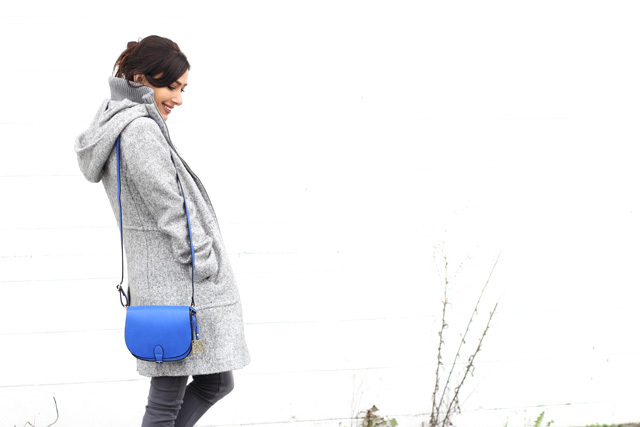 I absolutely LOVE this cobalt blue bag and it accents your neutrals perfectly! Love how you added a hint of blue with the earrings too! Have a great day! Thank you Haley! I actually found the earrings last minute at London Drugs - last place I thought would have gorgeous earrings. So glad I found them! Really love this bag! Its gorgeous! 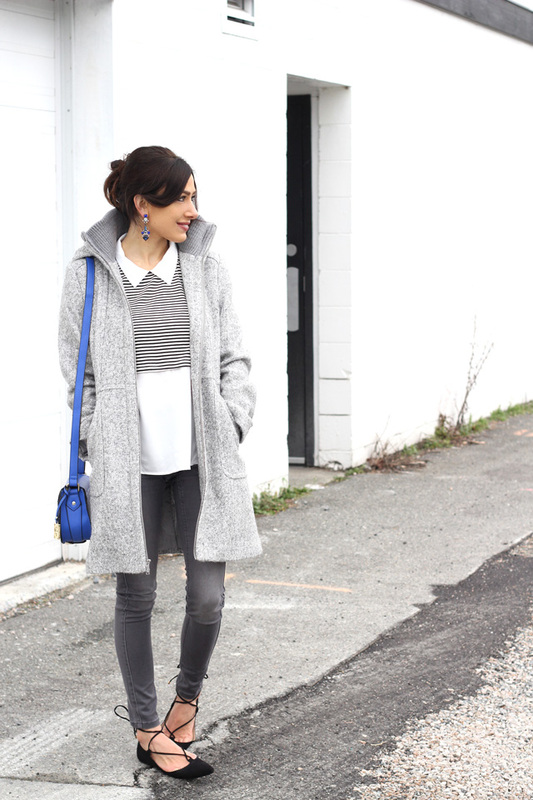 Such a great colour to pair with grey! LOVE these shoes! Amazing! I need to get a pair! Happy Thursday! ELA!!! This is so gorgeous! You are so beautiful and you make it look so easy! Love the grey and blue. Thank you love! I know you could pull off this look perfectly:-). 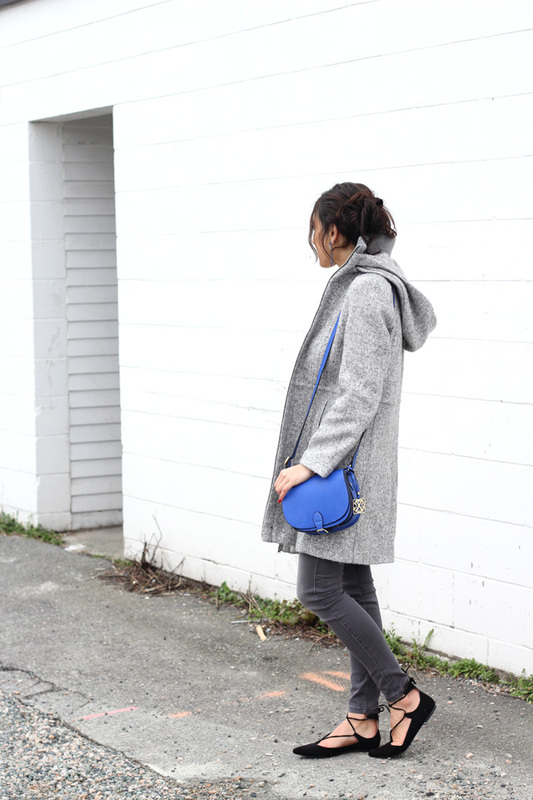 The blue bag matches so well with the grey outfit! 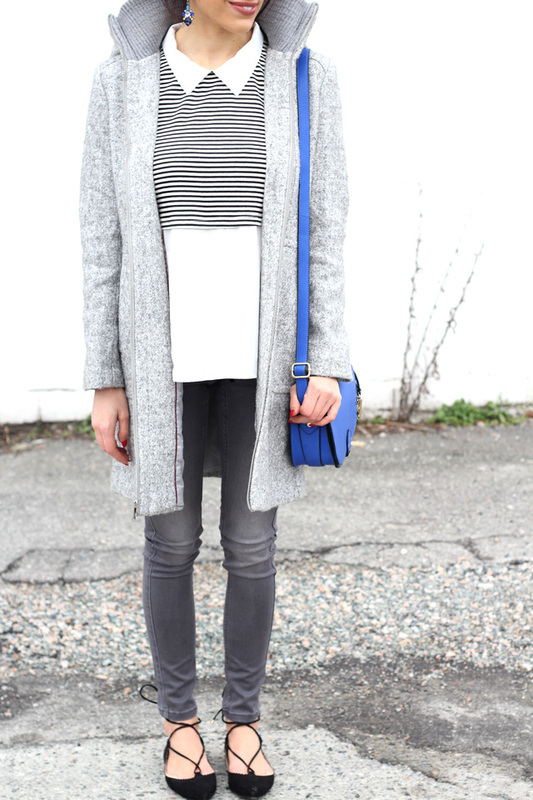 the blue and grey combo worked so well.. you look beautiful! 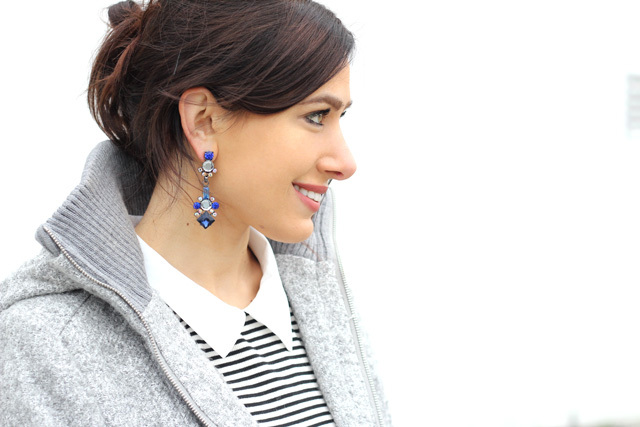 Oh my Gosh, I'm all about all shades of grey but that pop of cobalt is just perfect!!! I mentioned it to you on Instagram but have to say it once again honey - I am in love with this look on you. It represents everything I've been loving: grey colour (my fave for ages), cobalt blue (we even incorporated it into our wedding theme colours) and comfort :) You look gorgeous, lovely Ela. Hope you are having a really lovely weekend hon! Absolutely stunning combination! I love this color palette and the way you incorporated the pop of blue into is perfection! Thank you so much Molly! I know you would rock this look any day with your flawless style:-). Hope ur having an awesome long weekend! How did I miss this post? I love cobalt. It's such a great color and works as such a fun accent. You look lovely with your layers and greys. Have a great weekend and try those fries! Thank you so much Naomella! I'll definitely wear my hair like this for upcoming posts:-) Hope u have a great week and thanks so much for stopping by! You're super pretty and I really like your style :)!!! Thank you so much Hayley! So sweet of you:-). Thanks so much for stopping by!